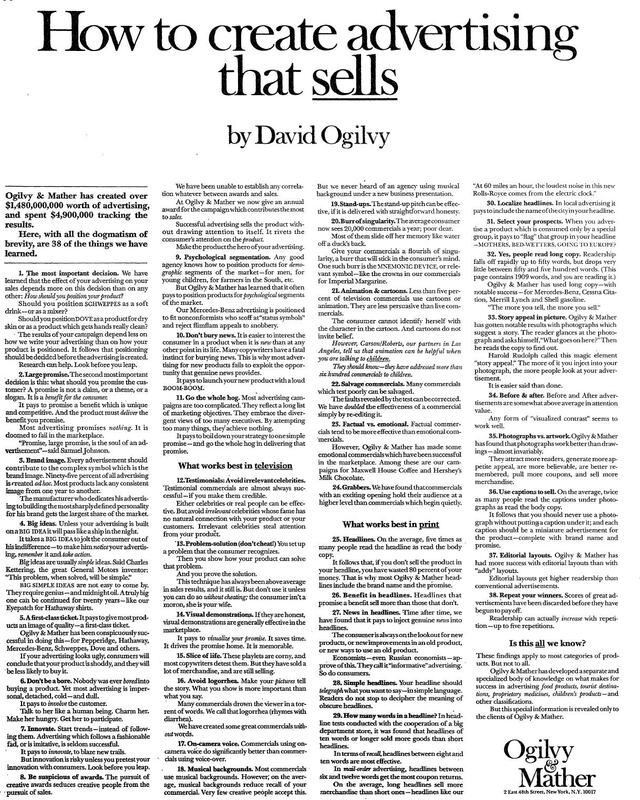 In 1948 David Ogilvy founded the agency that would later become Ogilvy & Mather. Ogilvy, who is often called the father of advertising, emphasized that the goal of advertising is to sell products and that successful advertising is based on information about the end consumer. Two of Ogilvy’s most famous campaigns are “The man in the Hathaway shirt” which was modeled after Baron George Wrangell in an aristocratic eye patch and “Only Dove is one-quarter moisturizing cream” which helped Dove become the top selling soap in the U.S. In the 70’s Ogilvy & Mather created a series of so-called house ads to better explain what they did and how they were different from other agencies. One of the most powerful ads is entitled “How to create advertising that sells”. At nearly 2000 words, it breaks one of its own rules on brevity but is worth reading over and over again. We have learned that the effect of your advertising on your sales depends more on this decision than on any other: How should you position your product? Should you position Schweppes as a soft drink – or as a mixer? 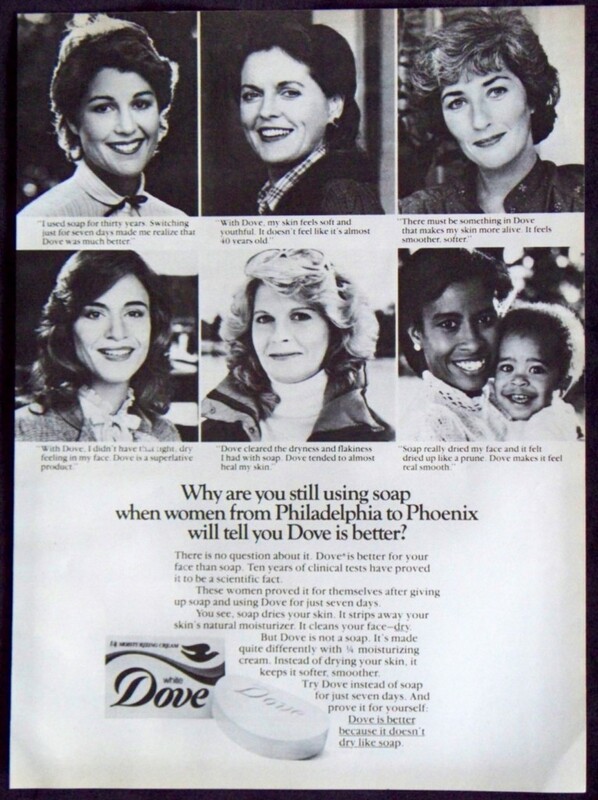 Should you position Dove as a product for dry skin or as a product which gets hands really clean? The results of your campaign depend less on how we write your advertising than how your product is positioned. It follows that positioning should be decided before the advertising is created. Research can help. Look before you leap. The second most important decision is this: what should you promise the customer? A promise is not a claim, or a theme, or a slogan. It is a benefit for the consumer. It pays to promise a benefit which is unique and competitive, and the product must deliver the benefit you promise. Most advertising promises nothing. It is doomed to fail in the marketplace. Avoid logorrhea. Make your pictures tell the story. What you show is more important than what you say. Many commercials drown the viewer in a torrent of words. We call that logorrhea, (rhymes with diarrhea.) We have created some great commercials without words. Headline. On the average, five times as many people read the headline as read the body copy. It follows that, if you don’t sell the product in your headline, you have wasted eighty percent of your money. That is why most Ogilvy and Mather headlines include the brand name and the promise. Would David approve of your advertising? This entry was posted on Sunday, February 12th, 2012 at 8:03 pm and is filed under books, communication. You can follow any responses to this entry through the RSS 2.0 feed. You can leave a response, or trackback from your own site. The points you make above are also fundamental to the human psyche and buying behavior. In this age of online and social media too, I don’t believe these advertising principles change. The execution may change/adapt to the media and be more conversational eg. one can provoke conversation by ending with a question, just like you’ve done in your blog above. However the ‘leading with the benefit’, the ‘what’s in it for you, dear customer’ would not change, imo. Your thoughts on this? In this age of social media, it is very important to understand these concepts because these can help shape your approach for your blog or your Linked In profile. How are you positioning yourself? I also liked David’s warning about seeking awards rather than sales – meaning the ad agencies looking for awards from their peers rather generating sales for their clients. Keep the real goals in focus – great advice. This statement seems applicable and worth considering even before you think about advertising, at the very beginning of product creation. Why are you building your product, how is being created to fit your positioning? I’ve long been an fan of Olgivy’s scientific approach, but I think that his lesser-known contemporary Howard Gossage (the ‘Socrates of San Francisco’) is maybe a more interesting fit with today’s world. Unlike Olgivy’s belief in the power of advertising, Gossage tended to emphasize its limitations. He thought there was too much advertising, and compared it to fertilizer, noting that most people lay it on so thick that it kills rather than nurtures (sound familiar?!). For example, one thing that is a little dated in Olgivy’s piece is the assumption that the company can decide the positioning itself, using advertising. Greater market transparency has handed a lot of power to consumers, leaving less scope for marketers to impose positioning. The reality of your product counts for a lot more than the Mad Men days when it was enough to say that your tobacco was “toasted” (they all were). While good marketing is timeless, positioning is now something that has to be created WITH consumers, and has to be about the “whole product”, including the community that forms around it. These are all very important, and relevant points related to advertising. USP, positioning, placement, are the key. However, I think consistency in the brand experience are what drive customers and community to engage with brands today. Advertising is now such a small part in the experience from my perspective. The brands that seem to push to the front of the line, in every category, are those that have created a more holistic brand experience that consistently engages their community, and develops a relationship through advocacy. I believe the ‘secret sauce’ to a successful brand, is being agile with your position and promise…making sure that the brand promise is consistent through every experience. If customer experience, does not create brand advocacy that is consistent with what you promise…the brand will not win…no advertising will help at that point. SAP has done a great job with the SAP brand…the customers, advocates and great brand experience speak louder than all the advertising.